We don't believe in generic solutions and of-the-shelf products. However, we do have a few basic items that really add to a functional setup and can extend the possibilities of your training - especially when used in connection with existing objects and elements. These are sollutions that have served us well over the years and still do - they are often everything and more than you really need! We design, test and manufacture everything ourselves - that's the only way to make sure the quality is top-notch. All our design follow European Norm EN 16899. Below you'll find our selection of proven design sollutions. - mini size version. Extremely easy to handle, especially great for kids. - small size version. Easy to handle, great for smaller groups. - slightly larger, more options. 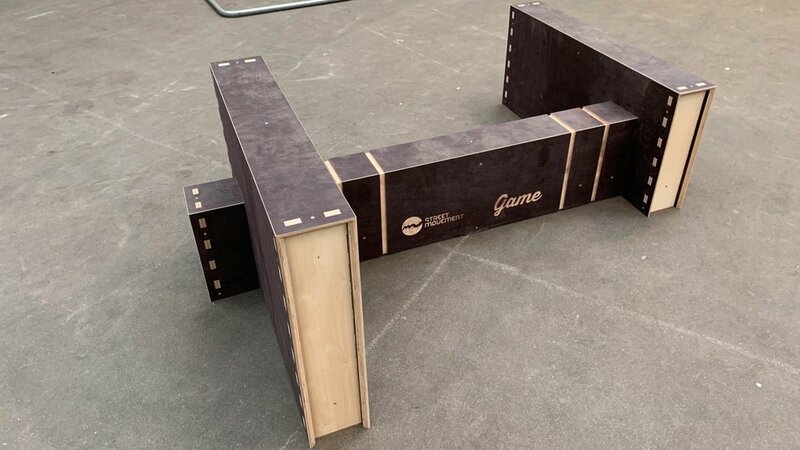 - the next evolution of parkour vault boxes! - 3 different size boxes + optional storage cart for all your vaulting pleasure. You can do-it-yourself - but please do so with extreme caution! If this particular scaffold looks and feels familiar, it's probably because you have seen one in pictures or even trained on one somewhere. The design has been built and is being used all around the World today. This is the scaffold we built way back when and have been using for years... It is very basic in its nature but accomodates pretty much every type of basic parkour scaffolding related movement that you would want. It has served us really well, brought us countless of good times, and has been the prototype, testing ground and blueprint for a lot of our later ideas - some of which have been refined and developed into other products that we use today. Everything you need for this type of scaf are off-the-shelf items that anyone can get their hands on - no design or industrial production skills required! All details are identical to the very first version we did, but you can, of course, play around with the placement and length of bars, if you like - be creative! - the DIY Scaf sollution and this guide should be used by competent people in controlled environments only! And by ‘competent people’ we mean someone who knows how to handle tools in general and what to check for with these components specifically - and does so diligently and often! However, this is still no guarantee for structural failure or other undesirable incidents, although this has never happened to us - so please be careful! The use of this guide is at your own responsibility - Street Movement cannot be held accountable in any form or way.